Home > TechTips > Is Your Website Mobile Friendly? I have been talking about the benefits to an insurance agency of having a mobile-friendly website and a mobile app for quite some time. For the most part, my advice has not been taken. Most agency websites look terrible on a mobile device. Moreover, very few insurance agencies have a mobile app. It is now more important than ever that your website is mobile-friendly. Why? Because Google says it is important. After April 21, if you want your agency to be found through an online search by consumers, then you have to get serious about mobile. This means that if your website is not mobile friendly then whatever work you’ve done to increase your search ranking will be lost almost immediately. It is easy to find out what Google thinks about the “mobile friendliness” of your agency website. 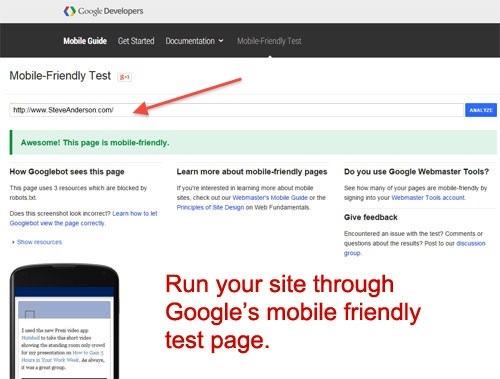 Simply run your site through Google’s mobile friendly test page. You should also check your agency website by searching for it on a mobile device — both Android and iOS. 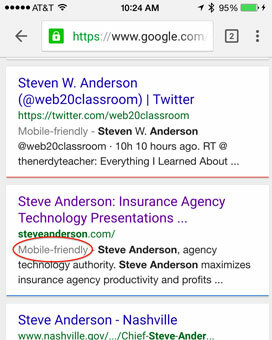 If the resulting search has a “mobile friendly” label, then your site complies with Google’s guidelines. It appears from news reports that this change will analyze mobile compatibility on a page by page basis, rather than a website-wide basis. Make sure your website is mobile-friendly. A responsive website is best. Get a mobile app for your agency. I recommend having both an Android and iOS version. For the few agents that have an Android app associated with your website, make sure it is indexed as soon as possible. What have you done to ensure that your website is mobile-friendly? Let me know.